HTC One is HTC's premium flagship for 2013, completed with a total overhaul of HTC One X/S/V series released last year. You’d be able to appreciate its finer design nuances when you experience the phone in person. However, before you go apoplectic with rage-the company’s magical new imaging technology, the bump to 1080p from 720p is not as drastic as going from all arrays of HD videos like AVCHD M2TS MKV and SD videos WMV AVI MOV FLV etc. Here comes a ultimate HTC video converter which is used to convert video to HTC supported video formats like MP4,WMV, 3GP etc. Which Video Transcoder Works a Treat in Video Conversion? Among massive video converting apps for HTC, MacX Mobile Video Converter stands out in comparison with the others in some respects including conversion speed, high quality, input/output files, features, ease of use. Best mobile video converterter to decode MKV, MTS, M2TS, FLV, etc to HTC mobile devices on Mac (macOS Mojave) and Windows (10) with no quality loss and 36× faster speed. 1. Features. 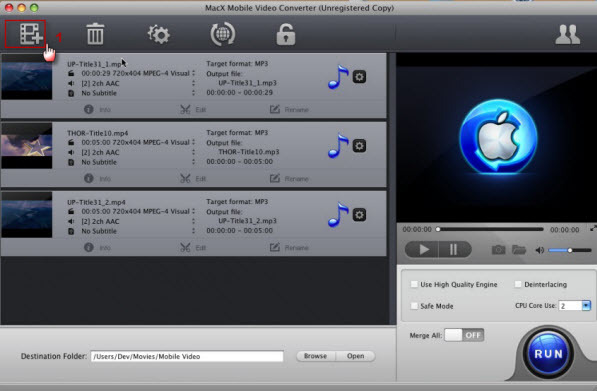 MacX supports nearly all popular video formats such as AVCHD, M2TS, MKV, AVI, MPEG, MP4, WMV, MOV, FLV and more to format viewable on HTC. 2. High quality. This HTC video converter can guarantee high quality video/audio output by built in "Yadif Double Frames" De-interlacing Engine and High Quality Engine. 3. Fast speed. By supporting Multi-core CPU especially for Intel Core i5 and i7, it running on Mac brings users up to 15x faster real-time converting speed. 4. Ease of use. 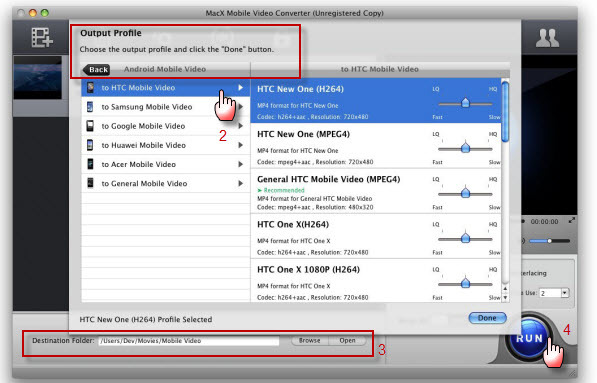 This is only for HTC One, HTC One X/S/V customized video conversion according to the hardware parameters. 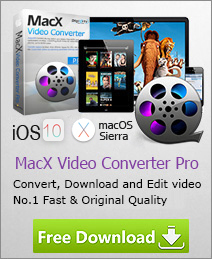 One-click, you can complete any video format conversion and transfer the video to HTC without hassle. Launch HTC video converter, click "+" button to import your source video files. You can load multiple video files and convert them all to HTC at one time. After successfully load the source videos, the output profiles windows will pop up automatically to assist you in choosing suitable profiles for HTC. 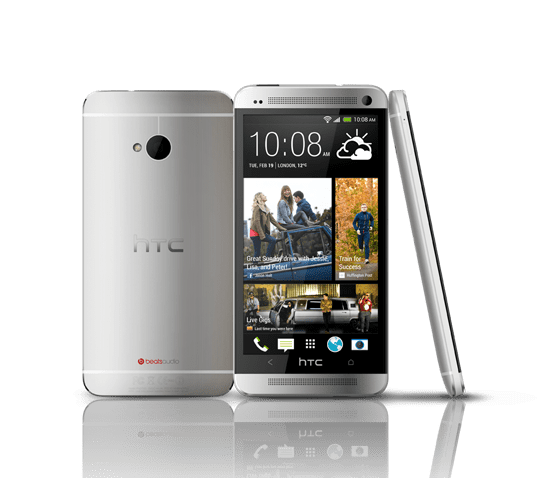 You can easily find the optimized presets for HTC 10/9/8, HTC One X under Android Mobile Video> to HTC Mobile Video. Step 3: Select Destination Folder. Click "RUN" button to trigger the video to HTC format on Mac. That's all. Once the conversion is done, mount your HTC One M10/9, HTC One M10/9/8/X/S/V on to your computer via USB, create a folder named Video in the root folder on the HTC, then copy converted file into the Video folder. Another pleasant surprise for this HTC video converter: MacX Mobile Video Converter is capable of extracting pictures from the video to be saves as HTC wallpaper. Of course, you can extract mp3, wma, aac for any video files to listen to them or make ringtone.